Earlier this month, NVIDIA announced their new RTX-based GeForce graphics solutions for notebooks at CES 2019 Press Conference. Riding the success of their exclusive Max-Q design, the new RTX 2080 Max-Q and RTX 2070 Max-Q were both released which can be used to power new thin and light gaming notebook systems in the market. Fast forward today, the veil is finally lifted, and we can finally share with you the new notebook computers and their performance. First up, we have the Gigabyte AERO 15, which was actually cherry-picked by NVIDIA CEO Jensen Huang for showcase during their CES Press Conference for showcase of the capabilities of the RTX Max-Q design. Let’s not delay any further and lay our hands on the unit itself. 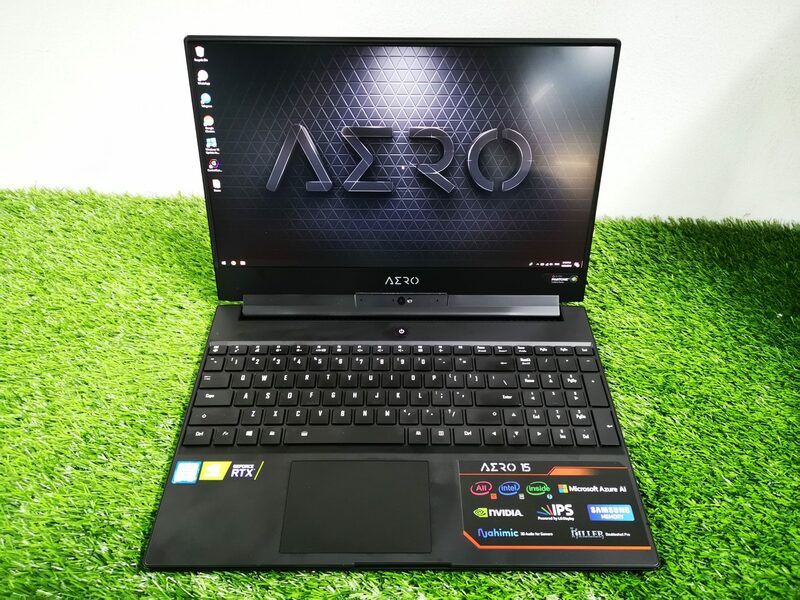 The AERO series of laptop from Gigabyte has always received great responses from media outlets worldwide because it truly possesses the qualities of high performance, while remaining thin and light. While retaining these fundamental aspects, Gigabyte further improved the quality of their notebook by utilizing only the best components for their system. Particularly, they adopted an “All Intel” Inside system, which utilizes the new generation Intel Core i7/i9 H processor, that is coupled with the Intel 760p SSD and Intel based Killer 1550i Wi-Fi Adapter. Moreover, to harness the capabilities of Artificial Intelligence, they also worked with Microsoft to develop a system optimized setting on the CPU and GPU for the best performance under different use cases. How much differences will these new advancements in a gaming notebook make? Let’s take a deep dive into the various aspects of this notebook and find out just how much real value it brings onto the table. For the Singapore market, there will be two variants available, namely a Core i9-8950HK model with RTX 2080 Max-Q (AERO 15-Y9) and Core i7-8750H with RTX 2070 Max-Q (AERO 15-X9). We managed to get our hands on the AERO 15-X9 model for review today. On the left, there is a Gigabit LAN Port, USB 3.1 Port (Gen2) , HDMI Out Port, a USB 3.1 Port (Supports Display Port Protocol) and Audio/Mic Combo Jack. On the right, there is a SD Card Reader, Thunderbolt 3 USB C Port, 2 x USB 3.1 Port (Gen1), DC Jack and Kensington lock port. With a glance on the specifications sheet, everything looks good. The AERO 15-X9 has what it takes to perform extremely well. As the title of this article suggests, Gigabyte did not make any compromise to the choice of hardware used in this system. They selected the best possible components to bring out the best of the system. For the professionals and gamers, this is probably what you would look out for in a perfect system build. Honestly speaking, nothing much has changed for the exterior of the AERO. There isn’t much difference in terms of its design when compared to its previous generation model. The whole unit has retained its light and slim profile design, which just measures at 18.9mm thick. Unlike many gaming notebooks, the AERO notebooks can easily stand out from competition because of its distinctively thin display panels. Such a feature truly brings out the premium feel of the notebook, and showcases the design and engineering capabilities of the Gigabyte team to bring this to life. We have to applause Gigabyte for choosing a simple and minimal design for the AERO 15 notebook. Thankfully, they did not include too much unnecessary flashy RGB lights around the unit in order to attract gamers. As such, the AERO 15 notebook will also look very professional and suitable when you bring it to your workplace or a meeting. The only problem we had with the AERO 15-X9 is that its webcam is placed at a rather awkward position. The camera will be tilted, depending on the angle of the display panel. This causes the images captured very unnaturally, and there will be no way for users to look at the screen and camera at the same time for a more natural video conference or stream. By popping out the back cover, we will have direct access to the various components that powers the Gigabyte AERO 15-X9. It is great that it is easy to change any of the components in the system. For upgrades, users can potentially upgrade their RAM on the unit just by popping in an additional DIMM of memory. Currently, only a single 16GB RAM is installed on the unit. This will be rather interesting, as a single memory that’s pre-installed will also mean that the system will only run in single channel memory mode. We thought that perhaps Gigabyte should have chosen to install 2 x 8GB sticks in it instead to enable dual-channel memory configuration for better performance. Regardless, having a single 16GB DIMM installed also allows you to simply purchase an additional 16GB DIMM to upgrade to 32GB in running in dual-channel as well. In the end, it’s probably still up to the users. There are also two M.2 slots. This means that you can potentially increase the storage size of the whole system just by popping in another M.2 SSD. We can also see the thermal design of the AERO 15-X9. All the major heat emitting components are connected to heatpipes that will conduct heat right to the exhaust vents, where there will be an exchange of hot and cold air to cool down the whole system. The GIGABYTE Control Center is a one-stop software that allows you to control all the different settings of the AERO 15-X9 notebook. In the main dashboard, you will be able to get to know of the health status of the system at any one point. The software also links to other key software and controllable features of the system under the “Manager” settings. The keyboard illumination can also be controlled directly on this software, under the “Fusion” section. The different RGB effects, speed, lighting brightness and colours can all be set here. Moreover, users can even select the lighting profile that is based on games, which will automatically light up the main keys used in those games. As for the Device Settings section, the fan curve profile of the notebook can be specified. There are already a few pre-configured profiles, such as Gaming, Normal and Quiet for selection. Interestingly, there is also a “Deep Control” mode, which automatically creates a fan curve base on the user’s usage. Lastly, the software also keeps track of the main drivers and utilities that are important to the notebook. It will show each software’s current version installed, and prompt users if there are newer drivers of software available. As mentioned earlier in the introduction, the Gigabyte AERO 15-X9 is also powered by Artificial Intelligence. The term “AI” could be overly used, and perhaps sometimes even in the wrong context. For the layman, AI within the Gigabyte AERO 15-X9 is meant for the automatic adjustment of CPU and GPU limits, in order to best achieve performance with respect to power consumption. By looking at the type of applications that are running, the system is able to intelligently detect the types of processes and apply various profiles to the system in order to make sure that the system keeps within its power limits. There are specifically two kinds of AI inferencing that takes place within the system, which are branded as AI Edge and AI Cloud. By default, with the AI software installed, the system is able to take the details of running processes and put them through as inputs to a trained model. This model (which essentially what makes AI, AI) will then produce an outcome, which tells the system the best CPU and GPU configuration profile to choose from. This is known as AI Edge. On the other hand, to further improve the model for a more accurate inference of the best CPU and GPU configuration profile, AI Cloud will send the system’s usage profiles to Microsoft’s cloud services for analysis. This is also why there is a need to accept the GDPR agreement prior to enabling AI Cloud, as you will be essentially giving your system’s information to Microsoft. With AI Cloud, Microsoft can then install a better trained model to the systems via software updates. In my opinion, it seems like the whole AI Cloud system is a opportunity for Microsoft to take data from users in order to provide better optimizations to their operating system in their future releases. At the same time, the AI feature is also said to change the fan speed, keyboard and sound settings as well. We’ll take a look at the performance differences when AI Edge is turned on for our performance tests later. Generally, we had an extremely good impression and experience on the AERO 15-X9. Here are the key points that are worth mentioning. The keys on the AERO 15-X9 required 74 grams of force to press down the keys. Each key will travel about 1.4mm before reaching the bottom, which was suitable for all the different types of usage scenario, be it gaming or productivity work. Typing was rather comfortable once we got used to it, as there is a tendency to accidentally touch the keys at the Numpad area. The layout for the main QWERTY keys were fine, but we thought that it was rather cramped when it comes to the numpad. The AERO 15-X9 uses a 1.56″ LG 144Hz FHD IPS Display panel. One advantage it has its x-rite PANTONE certification, with colours portraying just as how they are meant to be. We don’t see any over saturation of colours that was quite a common problem in other lower end notebook computers. Moreover, the 144Hz refresh rate of the display panel simply makes operating the whole notebook so smooth and responsive. The only grievance we had with the AERO 15-X9 was it just wouldn’t go as bright as other laptops, but of course, it’s current brightness level at its maximum is already more than adequate for various usage. Be it watching movies on YouTube or playing games on the notebook directly, we felt that the panel did perform up to par to most high-end display panels. The 144Hz refresh rate capabilities further sweetens the experience on the device. Of course, the overall experience from media consumption and games does not just come from display quality. Audio quality is equally important as well. Thanks to the use of Nahimic audio technology that’s integrated into AERO 15-X9, we found the overall audio experience to be above average. The Nahimic Windows App helps us to tune the audio profile and frequency focus of the speakers on the unit to fit different scenarios. Nahimic has also included a few common profiles, such as Music, Movie, Communications and Gaming for easy change of audio settings. Enabling these effects created a rather huge difference in terms of audio quality, as we experienced that sounds were much wider in range, had a better impact and was more immersive. CPU Performance Test – Will enabling Edge AI mode make any difference in CPU benchmark tests? Memory Test – How much will memory performance be affected with only 1 RAM installed, running only in single-channel mode? Storage Test – How fast is the Intel 760P SSD as compared to a typical NVMe based SSD? Graphics Benchmark – How does the RTX 2070 Max-Q perform, when compared to the previous generation Max-Q Graphics Card? Gaming Benchmarks – Can the AERO 15-X9 run well with games with high settings at 1080p resolution? Based on the PC Mark 10 tests, we can see the AERO X15-X9 falls into the 68th percentile, out of all the systems tested. The high score is also testament to the use of all premium parts that are installed on the notebook, allowing it to achieve a rather high score in the respective tests. Also, since it the score is also higher than a typical 4K gaming PC, we do expect that this machine should game quite well as well! For our CPU tests, we want to find out how much difference there is when Edge AI mode is turned on. Will the software be able to correctly infer the right system profile to utilize, resulting in higher performance? Let’s see. Based on the results on CineBench R15 and Blender workload rendering a BMW graphic, we saw did see some difference in terms of performance. With AI mode turned on, there was a slight improvement in CPU performance in our CineBench R15 test, but in our opinion, these performance gains could be negligible. Less would we expect that the system actually performed worse when AI was turned on for our Blender test. When AI was turned on, the whole render took about 30 seconds more than when AI is turned off. We confirmed the results with the same test multiple times, and each resulted in similar results. It seems like this technology that Gigabyte is utilizing is still far from mature. Perhaps, if Cloud AI is enabled, and with more data made available to Microsoft, they would be able to devise a better model to further optimize the system profiles for even higher gains in performance. We are somewhat skeptical with this technology, as we thought that perhaps the system should just simply run at its full performance without any intervention, isn’t it? For the memory test, we pitched the AERO 15-X9 against the Lenogo Legion Y530 and ASUS TUF Gaming FX504 gaming laptops. All the system uses the latest Intel Core i7 8750H processor, and all their RAM runs at the 2666MHz frequency. Like the AERO 15-X9, the ASUS TUF Gaming FX504 utilizes a single channel memory configuration. However, instead of the higher quality Samsung RAMs, ASUS used Hyundai RAMs which are timed more loosely. The results are clear. The high quality Samsung RAM on the AERO 15-X9 outperformed the Hyundai RAM found on the FX504. However, it is still incomparable to the performance of a dual channel memory configuration as shown on the Lenovo Legion Y530. Therefore, we would recommend that users upgrade their AERO 15-X9 with an additional 16GB stick in order to achieve the best possible memory performance out from the system. As mentioned, the AERO 15-X9 comes with a high-performance Intel 760P PCIe based NVMe SSD. Not all NVMe SSDs are made the same, as each of these SSD comes with different kinds of technology and hardware. To show a fair test, we wanted to run the CrystalDiskMark benchmark with some data already written on the SSD. This should also replicate a more real-world performance as well. As shown on the benchmark tests, when compared to the Transcend PCIe SSD 110S (which we reviewed earlier), we can see that the sustained read and write speeds of the Intel 760P SSD goes quite a bit higher than the Transcend. Moreover, it also fared very well across all the other 4K read and write tests as well. Just based on the graphics score from 3D Mark Fire Strike (DirectX 11), we saw the AERO 15-X9 fared slightly slower than the GTX 1080 Max-Q. However, the tables were turned when it came to the DirectX 12 benchmark, as the RTX 2070 Max-Q seem to really show its advantage. It was able to outperform both the GTX 1080 Max-Q and GTX 1070 Max-Q, showing real performance gains between the two generations of graphics card. We also took note that the system ran rather noisily when both its fans were running at full speed under load. This could be considerably annoying for gamers who do not game with headphones on. The AERO 15-X9 manage to handle some of the very demanding games very well, even when played in high settings. For most games, it was able to achieve an expected frame rate of 60FPS. However, for Assassins Creed Odyssey, it only managed 46FPS. Regardless, by reducing the graphics quality, we should be able to reach the 60FPS threshold easily. However, this gaming notebook is still not perfect. Gigabyte has to think of how to reduce the noise that is created by the fans when the system is under stress, and also find a better location to place the webcam. We also found the AI features to be gimmicky, and serve no real impactful purpose to the system. I think that if Gigabyte put more thought into these aspects, and improve these design anomalies, the title of “a perfect laptop” could be within reach. The Gigabyte AERO 15-X9 retails in Singapore at SGD3,899. It will come with 2 years of warranty, a Gigabyte Gray bag and the M6880X Gaming Mouse. It will be available at Challenger, Hachi.tech, Dynacore, Lazmall and Media Mart.